We work with our clients using a customised Kan Ban PM Methodology. We use a customised KM Co Creation Framework - SECI Framework - to ensure practical value for the project is generated. KanBan is an Agile Project Management Methodology. It has been used in 3 different sectors - Manufacturing, Retail and Software Development. It helps to uncover workflow problems to ensure JIT - Just In Time - Delivery. SECI is a knowledge creation framework. It is related to organizational learning, business administration, and information systems. Standing for socialization, externalization, combination, internalization—as highlighted by Ikujiro Nonaka. Business mentoring support on a project basis. Zufi specialises in co creating innovation with entrepreneurs. A UK Top 50 Business Adviser for 2014 & 2018. He has over 20 years’ experience in the SME sector. He has an Action Learning based MBA in International Business Management with a SME focus and BA (Hons) in War Studies. ​His work on Business Strategy Implementation was recently published in a peer reviewed Innovation and Entrepreneurial Business Journal and the Chief Strategy Officer Magazine. Here he crossed applied Military Strategic Thought for the High Growth SME sector. Zufi is a Fellow of the RSA. He was a Registered and Approved Growth Coach with Growth Accelerator for 2 years. He voluntarily uses the EMCC Code of Ethics. He was a member on the judging panel for the 2014 Sirius Programme organised by the UKTI. He was a Mass Challenge Business Mentor and a Judge on NYU Stern Entrepreneurs Challenge for 2015/16. 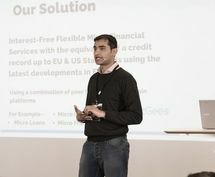 He was a member of the winning teams at the Fintech Jam & the mipster Hack at Kiosk HQ London in 2016. We work as part of an Eco System of Professional Service Providers.